This post is for anyone who hates their kitchen cabinets and is thinking of doing a DIY Kitchen Makeover and transforming the cabinets with paint. 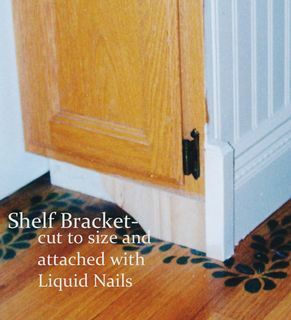 I could have named this post: How to add molding easily to stock cabinets and how to paint cabinets to look like new. How-To Paint Kitchen Cabinets and How-to Install No-Miter Molding without fear. Fast forward a few years – I just could not look at them anymore. I had successfully painted many pieces of furniture and knew I could paint the cabinets; it would just take a little longer than just re-doing one piece of furniture. These cabinets have wood doors and fronts, but the sides are made of laminate to look like oak and were slightly lighter in color. The sides were also recessed from the front, which left the perfect amount of space to add bead board to the sides without having to add finishing trim. 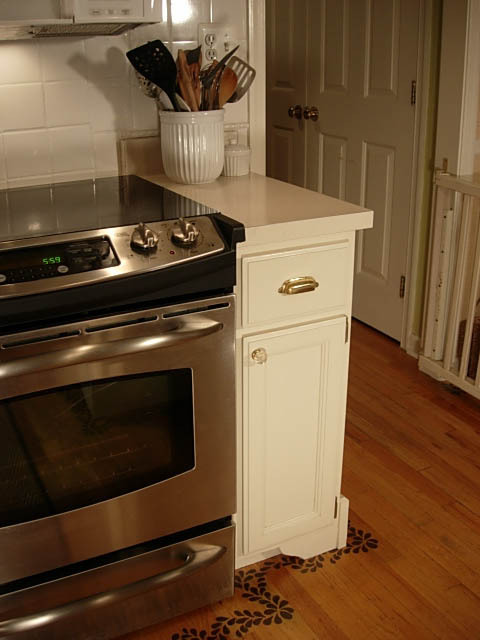 I wanted them to look as professionally done as possible so I took a trip to Home Depot to investigate how I could add some detail to the cabinets themselves and found No-Miter molding. The sign said – professional results, eliminating the need for miter cuts. Specifically designed to highlight corners and turns, which was perfect as I wanted to highlight my center island. The possibility of having decorative molding in my kitchen was becoming a reality. I had a simple table saw and this was something I knew I could handle by myself without the help of my husband or a contractor. So I bought myself some decorative baseboard, decorative corners, bead board panels in two different styles, wide (Pickwick Pattern) and the narrow (traditional). I didn’t stop there – I had seen in many magazines, cabinets that had feet like a piece of furniture. I wanted that look. I can be quite resourceful when I really want something and found that pine shelf brackets sold in craft stores very inexpensively would work perfectly if I cut them to the correct height to fit under the cabinets at each corner to resemble feet. I was thrilled with all my efforts. The photo below was taken recently, but I painted the cabinets 10 years ago and they still look good. I had to touch up the cabinets under the sink, as they get the most wear. If you decide to do this the best advice I can give to you is – take your time and do it right. It took me 3 weeks. I worked a section at a time so we could still use the kitchen. I took the doors off and painted them on sawhorses set up in my basement. All the other work I did right in the kitchen. Get a really good 1” angled brush; it is worth it to buy the best one. I use Purdy brushes. When you are finished you can really be proud and say: I did it myself! I did not paint the inside of the cabinets, but I did paint both sides of the doors and a half inch strip inside – along the cabinet opening as you can see in this photo. 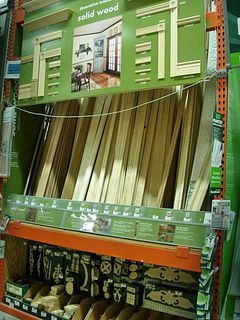 I bought all of my supplies at The Home Depot except for the shelf brackets which I got at AC Moore. 1. Cut bead board to height of section you want to cover. Starting at one end of each section – glue each tongue and groove piece on with Liquid Nails. The last piece you may have to cut width-wise in order to fit the space. Make sure as you place each section in that they are straight. You may need to add a finishing nail in some areas. I needed only a few. 2. Measure length of cabinet base for baseboard. Make sure to leave enough room for the corner pieces to fit. (Each corner piece has a notch cut into it so that it fits right at the corner. 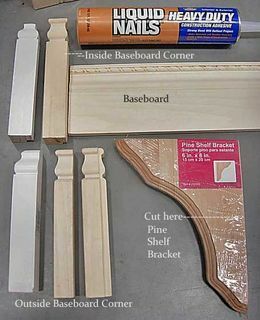 Cut baseboard to size and attach with liquid nails, then attach the corner pieces. 3. 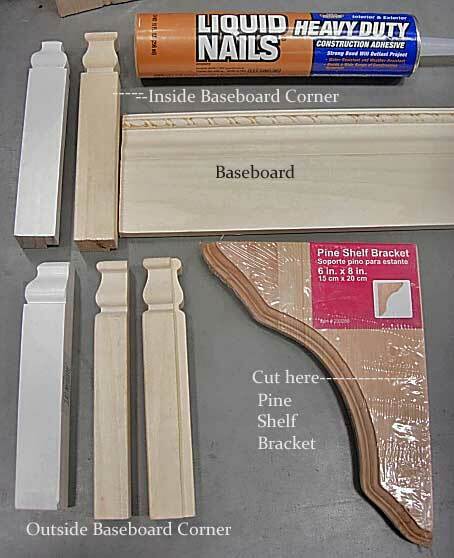 Apply a bead of caulk along all seams and junctions between bead board and the baseboard. This will make the pieces look like they are one. Lightly go over the caulk with a wet finger tip to smooth. Let dry. I used Glidden – Gripper primer and Sherwin Williams Pro Classic Semi-Gloss paint in Antique White. To make the painting process easier, do one section of cabinets at a time. Set up 2 x 4’s on saw horses to make a production line. 1. Remove doors and all hardware. Lightly sand doors and cabinet fronts. Clean off thoroughly with a tack cloth. 3. Apply two coats of latex paint. Let dry between each coat. If you need more coverage, paint another coat, but keep each coat light. 4. When dry – hang the doors back on. For more painting furniture inspiration, check out my Paint FAQ’s page. I have never commented before because I am pretty shy, but I have been a fan of your blog since I first discovered this post in 2010. I was so inspired, but I never had the courage to paint our new oak cabinets. When we moved into a fixer upper last year with original 1960’s cabinets, I used several of the ideas to make our tired cabinets look high end. It brings me so much happiness working in my kitchen everyday so I wanted to to thank you because those decorative touches with the moulding really make it shine. Hi Diane, Just a quick post to say I’m in awe of your site. I first found you a year or so ago when I was trying to craft a large monogram for my front door. I followed your instructions but my version looked a little to primitive so ended up using my silhouette cutter with chipboard, cutting the same letters five times each and gluing them together before assembling the monogram. I used similar colored leaves and the end result was perfect. It seems each time I see a post that interests me or search for an idea, you are there and one step ahead lol! I too am researching lakefront homes and I’m now following you on Instagram and excited to see where your travels take you. Im sure that you are aware of the Lakefront website with locators across th US but if not please message me and I’ll get it to you. I’m also planning a kitchen remodel so the info you provided here will be very helpful to me. Thank you again for your wonderful posts!! It looks as if you changed the hardware (hinges) also or the colors in the pictures are off. It looks like you started with dark hinges and now have brass ones? But I did not find this in your list of materials or explanation? Yes – good eye :-) I did change the hinges. I had to search for the exact style, but in a gold tone. 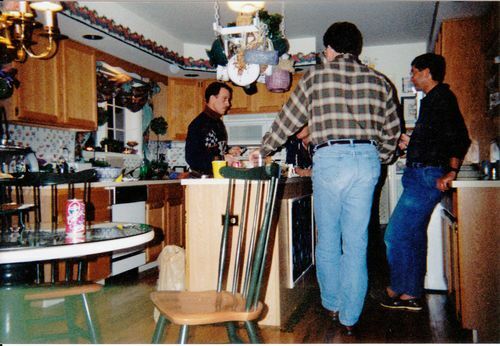 When I wrote the post, I had painted the kitchen 10 years prior. I was concentrating on the painting steps and forgot that I changed the hinges from antique brass or a brighter brass. Hi Diane, Your kitchen came out really nice. My husband and I are getting ready to paint our kitchen cabinets (at least we are talking serious about it) I love the Sherwin Williams line of paint but I have to ask if they really come out without any brush strokes? And when you say paint ridges, do you mean the line that you get on the end of the piece? I get that a lot on painted projects and it seems like I have to really sand very hard to get it off if I can even get it off without going back to plain wood. Do you have any suggestions for this? I appreciate any feed back that you can give me. On another note I love black painted furniture with the pottery barn look. Do you think I can get that result if I use the black stain? I think your work is really good so I am asking you for your help. PLEASE !!! I trust your knowledge from the beautiful work that you do. If you use a high quality brush for latex paint then, yes using the Sherwin Williams paint there will be no brush strokes. If your cabinets have a wood grain in them, you may see that after painting, but not brush strokes. The paint self levels. It is really true. When I use the word “ridges” I am referring to the line that sometimes occurs when you roll on paint. The ridge of paint can happen where the edge of the roller ends. If you see extra paint being depositing on the surface along the ends of the roller, you have to go over them to smooth, before the dry. If you are getting paint ridges on the ends or edges of the pieces you paint, you may be applying the paint too heavy. More lighter coats are better than one or two heavy coats. When you get to the edges, go over a few times with the brush to smooth. Wait a few minutes to see if any of the paint is sagging, dripping, or not leveling and go over with the brush to smooth. I like the look of the black stain on furniture. 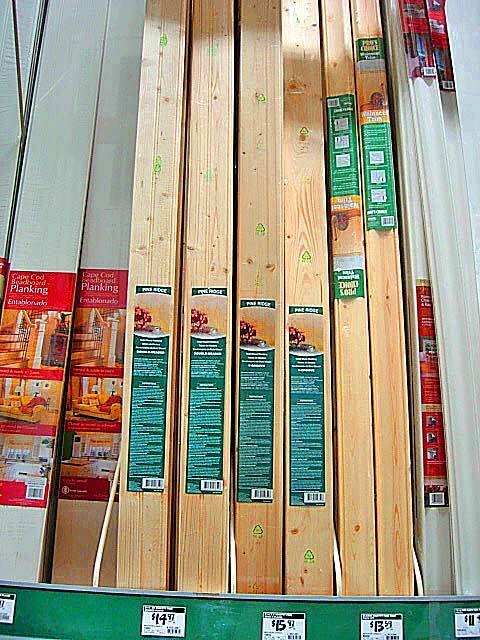 For cabinets you would have to make sure you brushed it on super evenly over the fronts of the cabinets. Since they are large vertical flat areas they may show any imperfection in the color and brush strokes. I think I would stick with paint. The stain is great for use on smaller projects or pieces of furniture with less vertical large areas. If you decide to go the stain route – test it first on a small area and see. Having painted my cabinets twice now over 12 year period. I highly recommend going with paint. Practice your paint strokes on some scrap wood to get the hang of it and use a foam roller with rounded edges to lessen paint ridges forming. Use Purdy brushes. Use a tack cloth before every new coat to make sure you are getting all the dust, grit, hair etc off. 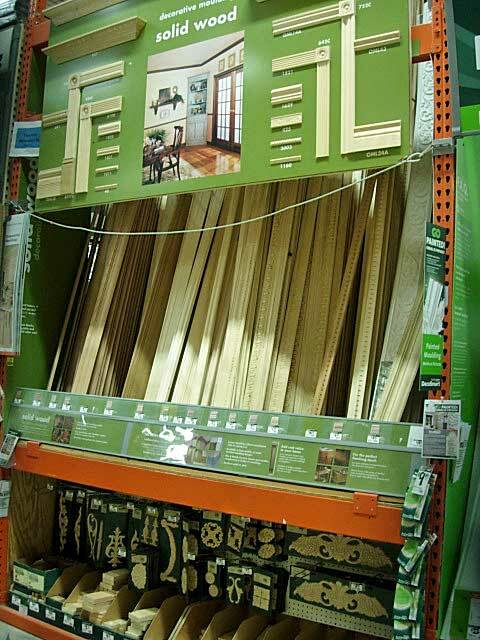 Take your time and paint the cabinets section by section. Remove the doors and set up a boards on saw horses so you can paint both sides of the doors. With a little time you will be rewarded with a brand new look for your kitchen. I really like all the details you incorporated into it. I have the same cabinets and I was wondering if colored stain can be used instead of paint. I want to have a red oak/ cherry tone. I don”t know if the stain will adhere to the laminate sections of the cabinets. The sides I can purchase panels for and stain.. but the front is area where I’m baffled on what to do. I have used opaque black stain over polyed wood furniture with success, but have not used a regular wood colored transparent stain. I think it may end up looking streaky if it was not on applied on bare wood. If you have two different types of wood and or laminate the stain may take to each differently which would not be a good thing. Minwax makes a few different type of stain – some do have poly in them. I would go to: Minwaxblog .com and ask Bruce Johnson. He would be able to tell you what product would be the best to use. We just updated our kitchen with painted white cabinets, custom vent hood, stainless appliances and marble counters! ( I still get goosebumps just looking at it all!!) I love what you did with your kitchen and I’m using your design as inspiration to decorate…. baskets on a cabinet shelf, mixing white tones and I’ll be installing some shelf brackets to dress up the toe kicks. Would you share with me what you used as a towel rod on the end of your island and where you found it? Thanks for all of your fantastic ideas! My best advise to you is to use the best brushes and roller you can afford. As far as the details of how I did it. I placed saw horses in my basement with two by fours going across them. I placed the cabinets flat on top of the 2 x 4’s , doing one side at a time. I used a foam roller for the flat areas and a 1- 1/2″ angled Purdy brush to do all the bevels and edges of the cabinets. I painted each side – the whole side and edges all at once, let dry and added the next coat, When it was dry, I flipped and repeated the process on the other side. Since the side edges were already done, I just checked to make sure it looked OK. I looked for drips and used the paint brush to get rid of them. If you get dried ridges of paint – sand with medium to fine grit sandpaper in between each coat. Use light coats only – no heavy coats. Drying time depends on your weather conditions. I would wait at least a 4-6 hours in between coats, maybe more if you live in a humid area. Did you use a brush for the latex paint or the roller on the doors? Is the key to put light coats of paint? Hi Lucy – I used both. A 1″ angled Purdy brush for the beveled trim on the doors and a sponge roller for all the flat areas. 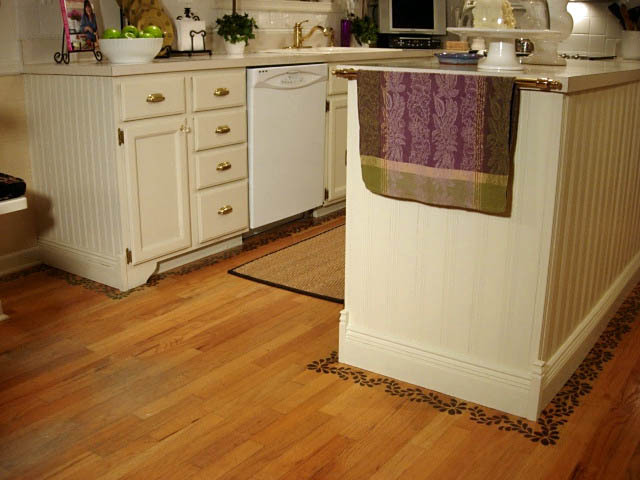 Diane – Why did you decide to go with a waterbase/latex versus an oil base paint for the cabinets? Now that your kitchen has been finished and you’ve lived with it a while, how is the durability and clean-up/stainining with latex? Thanks – look forward to your response as I’m just about to begin my kitchen cabinet paining project. Thanks! I chose latex as I didn’t want the hassle of oil. I made the right decision. My brother-in-law is a pro painter and he used oil when he painted his cabinets around the same time I did mine. His did not last. He now uses the method I used. It has been over 10 years since I painted the cabinets. They have held up perfectly. The only problem spot is the two cabinets that are under the sink. I keep the trash can there and the cabinets get dirty faster. I clean them more frequently right around the cabinet knobs, I have touched the area on these cabinets with some paint. It took about 5 years for that to happen though. 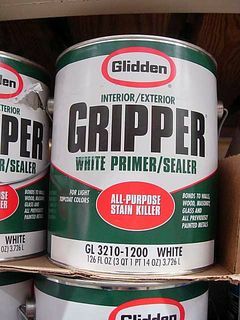 If I was going to paint cabinets again – I would do the same process – Gripper primer, and latex or latex enamel. I never liked my kitchen before, after painting the cabinets – it became my favorite room in the house. Did you put glass in that cupboard door yourself? I love how your kitchen turned out. I have old cabinets, 1960. Just plywood doors. I am afraid to start but they need help. lol Love the color too. hi Lucy -Yes, I added the glass to the cabinet door in my kitchen. I felt there needed to be some contrast and interest added. I did it a long time ago. It was not hard to remove the wood panel. I used a jigsaw on one side and the panel slid right out. I measured the opening and had glass cut to fit. I did not want to see clips or glazing points to hold it in,so I used hot glue:). I did this 15 years ago so it worked like a charm – very secure. The hardest part was getting molding cut for the mullions. My dad is great with a router and made them to fit. 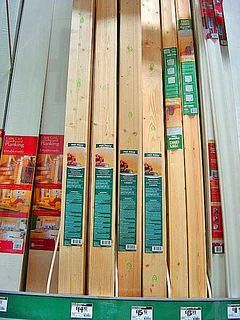 Nowadays there is such a great selection of small trim molding available you could buy it instead of making it. Just found you via Country Living and Finding Home. Awesome Blog! Was worth a share on FB page. Love, Love, Love the kitchen! Exactly my idea, but didn’t know how to do it! I will use this site for my kitchen soon. Is the color of the backsplash tile bright white or antique white. I already have bright white but didn’t know if it would go with antique white cabinets. Thanks for the help!! You are very creative. Love all of your makeover ideas. Hi Liz – the tiles are white white and the cabinets are Antique White. I used both to try to create a balance between warm and cool neutrals. I have a white fridge, and dishwasher so the white color is balanced throughout the room, not just on the tiles. That is what makes the scheme work – making sure there are some other white features on other walls or areas in the room to create a pleasing visual flow of the color against the Antique White. Hello! Just found this – your kitchen looks great! I have pickled oak cabinets (kind of pink) and white appliances. The pickled oak color makes it very hard to do any nice colors on the wall – so I want to paint. I’d love an antique white kitchen but all my appliances are white – and my husband won’t let me replace perfectly good ones. How do you like the antique white cabinets with white appliances/ I’m afraid to do all the work then not like it! Hi LouAnn – I mixed the white and off-white on purpose. I love it and would do it again. I think the mix makes the kitchen visually warmer and more interesting. If you are still on the fence – look at the Sherwinn Williams color called – Creamy. It is a warm white without looking bright white. I used that on all molding around the doorways. When you do it on purpose it becomes your color scheme. To make it work – make sure to balance each of the colors throughout the space – so that as your eye moves around it sees both colors at the same time. I have the white white tile back splash, appliances, and dishes hung on the wall and on display so the color is throughout, not just in one area. 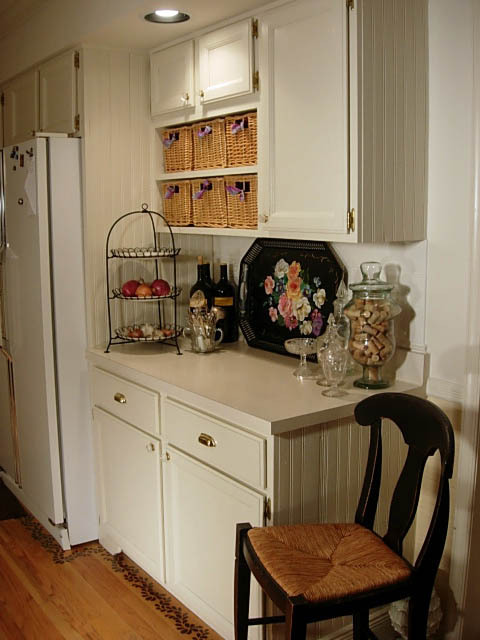 The cabinets, banquette, and crown mouldling are Antique White. thank you ,thank you ,this is perfect we had a leak this thanksgiving and it messed up some of my cabinets just like yours . I never could figure out what to do with those sides , now i do thanks to you ! I was completely amazed by your bathroom re-do and this is equally fabulous! I’ve only just discovered your blog through a pin of your tissue paper flowers, then the bathroom & now here. I need to go get my AM coffee. I may be here a while!! Seriously, you should try doing this for other people and get paid to do what you love and are so talented at! Ok I love your blog! I love your style and this blog is now my fav go to for decorating inspiration. I WILL be trying some of the projects I see here at your blog ! Thanks Diane! Amazing!! You should be house proud… Stumbled on your website and could not believe what you to your kitchen. Also loved the floor stencil so cute and not over done. So wish I had your talent. Everything looks beautiful…. Awesome job! What a difference the update has made. Love it! Hi, I love your kitchen makeover. I have oak cabinets that I am dying to paint, AND an eating nook where I want to build a banquette to save seating space and look pretty. I adore your kitchen island… but I am not sure that my galley kitchen has the required width to accommodate one. If you ever find the time (I am sure you are super busy), would you mind sharing w/ me the dimensions of your kitchen and island? I am so happy I found your site. I feel like maybe I can do this! My kitchen is 13 ft x 20 ft. The island is 26″ x 62″. The floor space where the island sits is 9 feet. I hope this helps. A neighbor of mine could not get her dishwasher opened all the way if she used a standard island cabinet. She had a custom one built that is narrow. 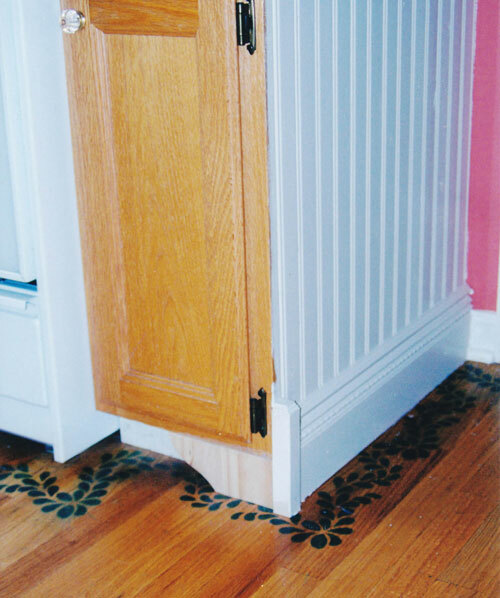 Instead of cabinet doors – she added tension rods and made dishtowel curtains where cabinet doors would have gone. If there is a will – there is always a way. I hope you can get it to work. OOOOHH MMYY GGOODD!!! the beadboard for the ends of the cabinets is GENIUS! i have the same color cabinets in our “new” home and they are driving me bananas and i went and bought my primer and paint for the cabinets two days ago, got home pumped to paint to be told by my hubby that although the cabinetboxes are wood, the ends of the cabinets have a “wood sticker” on them and if i paint, even with primer, it’s going to bubble. I have some leftover beadboard from when hubby redid the guest bedroom and placed it under a chair-rail and i when i saw the picture with the beadboard on the side i litterally threw my mac from my lap onto the sofa and bolted to the garage and then to the kitchen to see if it’d work on mine and IT DOES! ……looks like someone will painting the kitchen this weekend :) you are amazing for the inspiration i would have never thought about it! btw..my beadboard scraps were ready to go out for heavy trash day tomorrow since they’ve been sitting in the garage for about 4 months taking space!! My kitchen looks alot like yours in the layout except for the island. We have an U shaped kitchen and would like to get rid of the eating counter and add the island. I was wondering what size your kitchen was and the size of the island. You did a terrific job on the kitchen and I would like to have the same look some day. Thanks for any info you can send me. What a stunning transformation! I am so impressed with how glamourous it looks, especially givent that the only “major” change is the colour! Did you have any issues with getting a smooth, consistent finish? I’ve often thought about painting my cabinets, but have always been hesistant! Also, have you had any issues with peeling, cracking or bubbling? I live in a humid area that makes me wonder if it would be a problem long term. I am so excited about finding your site!!!! I read about how you painted your oak cabinet and your old kitchen looked alot like mine. I’ve tackled a lot of DIY projects but none as impressive as this! How fabulous that you can look at this EVERY day with such pride and accomplishment! Congratulations on an amazing job. Your kitchen is absolutely spectacular & your hard work shows!!! Thanks Michele- Doing it myself was the only way I was going to get a kitchen with white cabinets. It was worth all the effort as I still love it. Wow! I can’t believe this remodel wasn’t done by a team of professionals! Your kitchen looks amazing. I hate to admit it, but the before picture could’ve been taken straight from my house. Between keeping up with my job at Dish and the rest of the household, remodeling has been shoved to the backburner. This post has inspired me to take action though! I don’t know how you got so good at this stuff. Do you use any sort of outside resources for help? I’ve been watching HGTV and DIY Network for tips and tricks, and recording every show on there related to home renovation; it’s actually turned into quite the obsession. Luckily, I have the Hopper DVR box with loads of recording space to accommodate my DIY addiction. I wish I had a natural talent for it like you seem to! Keep up the good work! Wow, that is AMAZING! I’ve been trying to talk my husband into painting our 1980’s oak cabinets for years now, but he just won’t budge. I’m going to show him this blog & hopefully he might change his mind :) Thanks for sharing! I am a bit late with a comment, but felt the need to say how great your kitchen turned out! My hubby and I have done many DIYs around the house. We live in my childhood home, and my dad actually built it himself in the early 60’s with his brother and brother in laws, and my older brothers who were teens at the time. Anyway, dad was a salesman at the time for a company that made wood paneling. Every room in the house has a type of wood paneling he sold, and boy was he proud of it all! There is no drywall under the paneling, just plywood underneath. Both my mom and dad have passed away now. Well, by hubby and I have primed and painted each room with the exeption of the kitchen. I have had so many emotions with each room we redid, the kitchen I know will bring up more because all the time spent with my mom in there, who was a great cook. All the projects we did together, all the homework at the table!!! I see now I have been holding onto the kitchen, but it’s time to move on. But I gotta say, seeing your fantastic results, I need to just jump in. I know we can do it. It will be our project this summer. Hi Annie – thanks for the nice note. How special it must be to live in the house you grew up in. I can drive by the one I grew up in and always feel a little sad that I can’t run up the steps and go in. One of the houses my hubs and I lived in had paneling in every room, too. We primed and painted it all and WOW what a difference it made. As you do the kitchen you should save one part of it and use it as a piece of art on the wall. Frame the old knobs or make a coat rack, or save tiles and line a wood tray with them. This way you will always have a little bit of the original kitchen still present. Best of luck with the makeover. beautiful kitchen! and the flooring is amazing! nice taste you’ve got there. Hi – I love what you did to your kitchen!!! I have oak cabinets, but they are “pickled” or frosted some call them. Anyway it made them almost a pink color and I hate them. We’ve lived here 10 years and I’ve been chicken to change. Because… I also have white appliances. And I kept wondering what “white” would look like with white appliances. Your cabinets look a little bit off white, but it still looks good with the appliances! What color and brand paint did you use? Oh – and I LOVE the custom look you gave with the extra details! Fabulous work! a-maze-balls! i love love love the all white kitchen! you have my dream kitchen! great job too! It’s gorgeous! What a beautiful transformation. It doesn’t look like the same kitchen! Thanks for the tip and info on the non mitered trim. I’ve never seen it before – what a great idea (I have a kitchen island to build)! I have been wanting to paint my cabinets for some time but was worried about a white refrigerator with antique white cabinets. I just couldn’t visualize it but you have done it and it looks great! Thanks for the inspiration. Now…..how to talk the hubby into helping!! WOW! God has truly gifted you with amazing abilities. I love your ideas they are AWESOME! PS: I love how you put product names and pictures!! It is so frustrating to find all kinds of good ideas but no idea on how to find the products mentioned. Thanks again!! OMW! I am so glad I found your web-site. I am going to copy so many of your ideas! We are redoing our oak kitchen cabinets and purchased a new Rustoleum product that is as easy to use as paint but has the look of stain. I think I’m going to redo our carpeted stairs with the Rustoleum product (copying the stair project you did) and paint my cabinets white. I can’t believe the before and afters pictures of your house. I kind of dismissed your blog as a ‘rich girl-already has a super nice house-blog’ until I saw your before pictures. I have your ‘before’ house and am looking forward to using some of your ideas to get my house looking ‘super nice’!! Thanks!! Your kitchen is beautiful! Would you mind sharing the name of the wall color? The walls are Sherwin Williams Natural Choice. The cabinets are Antique White. This is so inspiring! I’ve been dying to paint my cabinets for 5 years, but I’ve hesitated because I wasn’t sure it would come out well. Looking at your results, I know it can be done! Good question. I did not paint the inside of the cabinets, but I did paint both sides of the doors. I will post a photo on the post later today so you can see how it looks. I do have one corner cabinet with a glass door. That cabinet got painted inside as you can see inside. I cannot believe you did all this yourself! congratulations! And I love everything. I have to design a kitchen for our old Victorian house and think this would be perfect. Love the floor stenciling. Your use of the shelf brackets is so creative. Thank you! Thanks. Redoing the kitchen was one of those projects that I wished I had done sooner. It has held up great and I would do it all over again. I wanted to have the built in furniture look for the cabinets and knew I could not afford new ones – so I improvised with the shelf brackets. No one ever knows until I tell them. I hope you enjoy designing the kitchen. Such a great post. Thanks for sharing all the info! We painted our kitchen cabinets white, too. They look SO much better! I think we had similar cabinets; ours had laminate on the sides (!?!? ), we put up beadboard, too. Painting my kitchen cabinets was one of the best things I ever did to make my house look and feel more to my style. I am sure you feel the same way about doing it to yours, too. I now want to take on two big corner cabinets in my family room that I want to paint white so they look built in. It has been 17 years – I think I need to just do it. I may use Chalk paint as you don’t have to sand or prime first. I will keep you posted. Thanks for leaving me the comment. I have 70′s dark wood cabinets. They’re sturdy but really, really ugly. I’d love to paint them as well but would LOVE to hear your tips for making them look as good as yours – they look as thought they were professionally painted or entirely new cabinets. I have 70’s dark wood cabinets. They’re sturdy but really, really ugly. I’d love to paint them as well but would LOVE to hear your tips for making them look as good as yours – they look as thought they were professionally painted or entirely new cabinets. Love it, I will be painting my cabinets very soon and i’ve been looking for different tips. Thanks, Did you use a paint sprayer at all ? TSP is the best for prep work. I haven’t used it in a while, but remember using it to clean walls before we wallpapered them. It is one of those no frills “classic” products that is inexpensive and works super well. Thanks for sharing the info. It took us one month. We used the top of the line benejamin moore paint and I think that made a difference. Tip: As we took the door and drawer fronts off, we labeled the hinges that went with each piece. These hinges allowed us to make all sorts of minor adjustments to keep the doors straight, etc. and we didn’t want to re adjust all of the doors. Putting the smae hinges back on eliminated that step. Thanks so much for mentioning the tip about marking the hinges. I do mark mine, too. I learned to to this the hard way – took the doors off of a piece I was re-doing all excited to get it done, only to find none of my door hung straight when I put them back on. Ya live, ya learn. It takes a bit of time in the begining of the re-do, but pays big time in the end. I recently posted about a a hutch I re-did and showed how I mark the hinges. I am so excited! I really can not stand my kitchen cabinets…i also painted my top kitchen cabinets white but they are really missing detailing or something. My house was really dark when we moved in…dark wood panel and dark kitchen cabinets…it felt like a dungeon. I painted the walls a light grey and some of the kitchen- but it is those little details that make a room look completed. What a wonderful job you did! I would really like to cut squares and put plexiglass in the doors – but that is a daunting task at this point. Nonetheless, i have been inspired…thank you! Wow! looking at your kitchen, I would swear you were a contractor. It turned out amazing! My sister is redoing her kitchen and I am going to send her your link. You are so talented and I love your blog! Your kitchen looks wonderful! You are really talented. Did you seal, poly, or anything over the painted cabinets? OMG! I’m in love. GREAT JOB. It is beautiful. Thanks for stopping by my blog. I’m drooling over your stove! It really makes me want to take the plunge on my refrigerator!! Browsing for good deals never hurts, right? I’m so impressed by your diy skills! Thanks for the major dose of inspiration :). You are brilliant!!! Great job. You should be very proud of yourself. Past amazing!! Pat yourself on the back girlfriend. What a feeling of accomplishment! Oh WOW that looks awesome. I especially love the one with the baskets, so very cute! The kitchen looks amazing. But what impressed me most (besides that you did it yourself) the description and the blog post was fantastic. So detailed and perfect! You deserve an award! I love the basket shelves. Your kitchen is beautiful! Thanks for sharing. GO YOU! You did an amazing job! Your kitchen inspires me to do my kitchen… sooner than later! Thanks for joining the Power of Paint Party! What an AWESOME job you did all by yourself on your kitchen…looks outstanding! Wow! You did an amazing job. Love the beadboard, just put it my kitchen update too- you can’t mess with classic cottage elements. Thanks for all the directions. 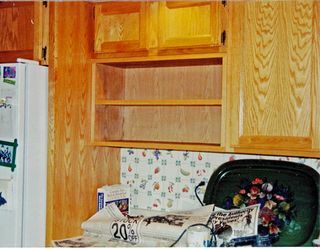 Great cabinets makeover and great directions and pics on sharing with others how to do this. i would of never thought of the shelf bracket idea. Love what you did. I have the same oak cabinets and would LOVE to paint them but can’t (I’m renting) but I dream nonetheless! Outstanding. Really. The smallest of touches always seem to make the biggest impact. Gorgeous kitchen! Great job, Hubby and I did ours together this summer and it was killer work. I know you worked hard. It looks great, I love the painting on the floor. Great job! I love the Antique White. I now have kitchen envy! Stopping by from SITS! That’s a wonderful makeover, great job, I have white cabinets but they are laminates so I will probably have to replace them, urgh! Found you via SITS, Happy SITS Saturday! This looks fabulous! You did an awesome job! I am gearing up to paint my OAK cabinets too! You have inspired me to GO FORTH!! Just found your blog and I LOVE it! I am a follower and I will be back! Wow, that looks so much better! Congrats on a GREAT job! Happy SITS Saturday Sharefest! Wow! Great transformation….good for you! Hi Everyone- Thanks for all the wonderful comments. I had stenciled the floor a few years before I painted the cabinets. The kitchen floor is in dire need of refinishing and when that happens the stencil will be gone. I found the baskets for the shelves at TJ Maxx. They fit perfectly into the shelves, but it took me 9 months of going around to many TJ Maxx stores to accumulate 6. It was worth the time and effort. When I move from this house, those baskets are coming with me. It looks fantastic. I love the basket shelf and the stenciling around the island is awesome. Well done. Beautiful work it looks like a professional did the work…hurrah for you! I am pretty much speechless! That totally looks like the pros came in and took over! The stencil on the floor is such a sweet touch. The basket shelf! 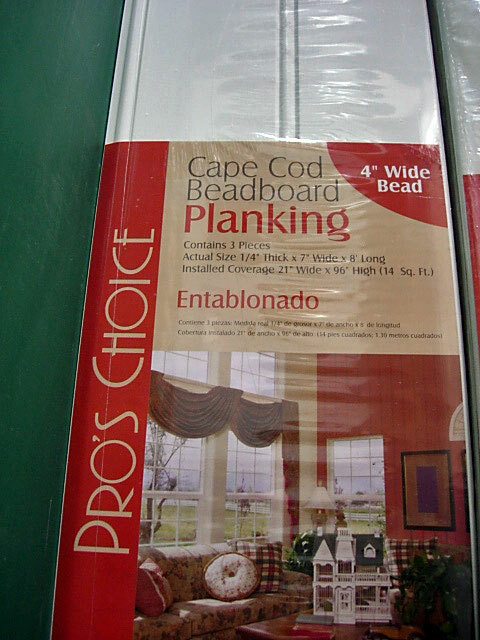 The beadboard…OK so I am not speechless! Awesome, amazing job! I soooo wish I had wood cabinets to paint pretty like this- mine are 50s metal! Are you kidding me?!?! That looks Fantastic!!! Great job!!! It looks amazing! I am itching to paint my plain oak cabinets. 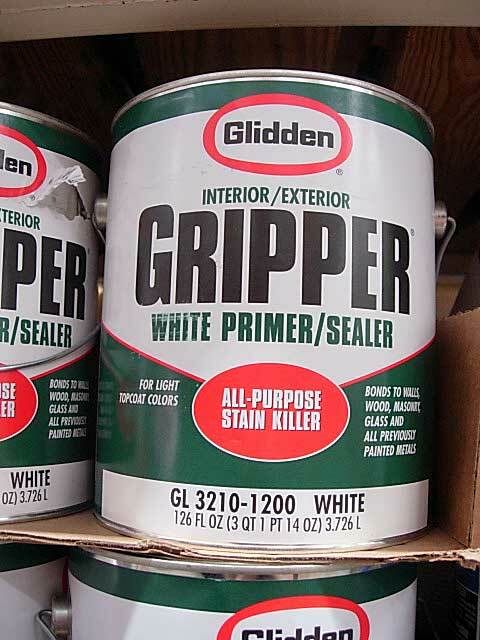 I’ve heard that oil based primer is the best to use, but I really don’t want to mess with it! I also want to put beadboard on the ends of the cabinets. I’m thinking of using the wallpaper kind. Thanks for all the inspiration! This is absolutely stunning! You did a really beautiful job. Kudos to you for taking the time to do this the right way. Gorgeous. That looks SOOOOOO great! You should be so proud, I am very impressed! Thanks for sharing!